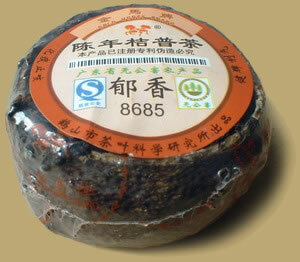 This special Pu-erh tea presented in orange skin is enjoyed as a medicinal health tonic. The tea is often brewed with small broken pieces of the orange skin included and yields a light brown liquor with a pleasant, mellow mild taste and matured scent. PREPARATION: To prepare Pu-erh tea, place about 2 tsp. of leaf per serving in a teapot. Rinse by covering with boiling water and quickly pour off. Fill with boiling water again and let steep 5-30 seconds (depending on how light or dark you want the tea) and serve. Pu-erh tea can be steeped 10-20 times.